It’s the morning of Maisie’s tenth birthday, and she can’t wait to open her presents. Maisie is not a typical kid. What she wants most for her birthday are the things she needs to build her own nuclear reactor. But she wakes to an empty house, and outside the front door is nothing but an unsettling, all-consuming blackness–a shifted reality. 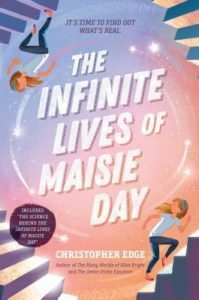 Even for super-smart Maisie, these puzzling circumstances seem out of her control . . . or are they? There is a lot of science in this book, which makes it great for science lovers. It might not be the best choice for non-science lovers though. It jumps back and forth from present and past which kept me interested, but sometimes was confusing too. I really liked the book because it made me think and I wasn’t sure what was going to happen next and what is real. I am excited to read more by this author.